To place an order, please email me with the stick name, and length of stick you'd like, as well as the payment option you'd like to use. PayPal, Money Orders, and Personal Checks are accepted. Unfortunately, due to past experiences, orders paid for by personal check will have a waiting period until checks clear. Thanks so much for helping to support the Loom with your purchases! 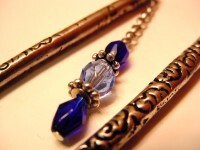 Silver and gold are used as color terms and not to mean pure gold or sterling silver, unless specifically stated. I have done my best to describe the color of the beads, and hope the pictures reflect the colors described. If there are any questions about colors, please feel free to email me. 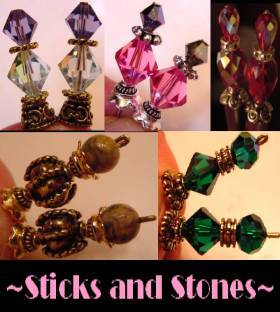 Matching earrings for any set may be available upon request! Be sure to check the New toppers page for the latest designs! Singles are towards the bottom of the page, so scroll down. 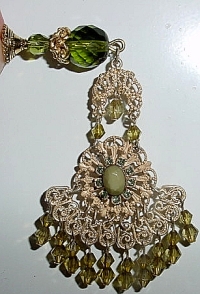 This dangle design is made up of Olive Czech glass beads in two different sizes. Beautiful matching dangle is the perfect compliment! Price: $13.00 on straight sticks, see pricing guide when topper is put on Ketylo stick. 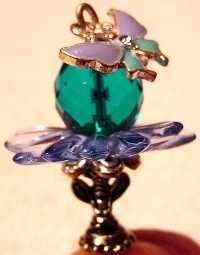 A Teal Czech glass bead sits beneath a plume of color! 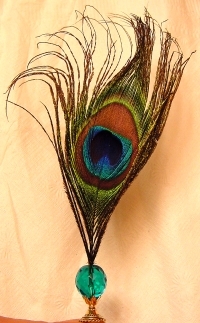 Peacock feathers flow up like a fountain of color from the bead. Gold findings complete the topper. Price: $10.00 on straight sticks, see pricing guide when topper is put on Ketylo stick. Here is another feather design, but this one is on a much smaller scale. shades of tan and black in the feather are set off beautifully with the gold Czech glass bead. Gold accents complete the design. Price: $10.00 on straight sticks, see pricing guide when topper is put on Ketylo stick. A Czech glass peridot rondelle bead sit beneath a beautiful Cloisonné rectangular tube bead. Silver findings complete the topper. Price: $10.00 on straight sticks, see pricing guide when topper is put on Ketylo stick. A faceted, Czech glass flat rondelle bead sits beneath a beautiful stack of diamond shaped Cloisonné beads. Gold findings complete the topper. Price: $10.00 on straight sticks, see pricing guide when topper is put on Ketylo stick. Czech glass in Olive rests in glass petals of light purple. Matched in color by the Cathedral shaped Czech glass bead, with copper glazed ends, this makes a lovely design. Olive bead can be exchanged for another color on request. Antiqued gold findings complete the topper. Price: $10.00 on straight sticks, see pricing guide when topper is put on Ketylo stick. Czech glass Siam and light blue beads are combined with Celestial Crystal bead at center. This design was a combined effort of my niece and I. It has silver findings, one of which features a star design at base, and a star shaped spacer at center. Price: $11.00 on straight sticks, see pricing guide when topper is put on Ketylo stick. Czech glass color infused (peridot and crystal) bead sit above Swarovski in peridot and a die cut pewter beads in antiqued silver. Silver findings complete the topper. Price: $10.00 on straight sticks, see pricing guide when topper is put on Ketylo stick. Copper wavy beads in spiral shapes combine with copper accnts and a copper Czech glass bead. Price: $10.00 on straight sticks, see pricing guide when topper is put on Ketylo stick. 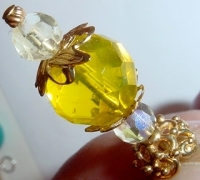 Czech glass yellow bead sits between two Celestial Crystal Lemon AB beads. Detailed gold findings complete the topper. Price: $11.00 on straight sticks, see pricing guide when topper is put on Ketylo stick. In this case, just because it looks like candy, doesn't mean it is! This beautiful hand made bead rests above a sterling silver bead. Silver findings complete the topper. Price: $11.00 on straight sticks, see pricing guide when topper is put on Ketylo stick. Czech glass Cobolt bead sits above a silver bead. Silver findings complete the topper. Price: $10.00 on straight sticks, see pricing guide when topper is put on Ketylo stick. 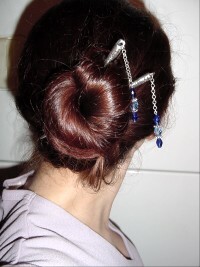 Czech glass in blue sits above a black rondelle. Silver findings complete the topper. Other colors available on request. Price: $10.00 on straight sticks, see pricing guide when topper is put on Ketylo stick. 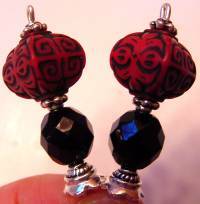 Czech glass in red sits above silver findings. Other colors available on request. Price: $10.00 on straight sticks, see pricing guide when topper is put on Ketylo stick. One topper only! Perfect for Thanksgiving!! Channel cut Czech glass in topaz sits above a swirling beautiful lampwork bead in shades of dark topaz and white. Gold findings complete the topper. Price: $10.00 on straight sticks, see pricing guide when topper is put on Ketylo stick. Blue Daisy Blossoms - New For Spring!  To learn more about our new Blossoms line, please visit our "Blossoms" page! Color infused Smoke AB Czech glass round sits above Czech glass in Jet. Silver findings complete the topper. Price: $10.00 on straight sticks, see pricing guide when topper is put on Ketylo stick. A pale, pink Celestial Crystal round sits above moveable leaves in silver. Curled headpin makes this blossom really special! Also available in gold. Price: $10.00 on straight sticks, see pricing guide when topper is put on Ketylo stick. Light Sage Green Czech glass sits beneath a beautiful Cloisonné bead with black background. Gold findings complete the topper. Price: $10.00 on straight sticks, see pricing guide when topper is put on Ketylo stick. Czech glass in light brown sits beneath a beautiful foil bead in vivid colors of brown, pool water blue, lime and a tiny touch of cream! Gold accents shown here, but may be identically replaced with silver. Price: $10.00 on straight sticks, see pricing guide when topper is put on Ketylo stick. Czech glass in baby blue sits above an even lighter baby blue rondelle bead. Color infused crystal cube sits at bottom. Silver accents complete the topper. Price: $10.00 on straight sticks, see pricing guide when topper is put on Ketylo stick. This unique stick combines the look of carved bone, with Jet Czech glass beads. Lots of silver accents complete the design. Shown here as a pair, available as a single. Price: $10.00 on straight sticks, see pricing guide when topper is put on Ketylo sticks. Czech glass beads in Jet and Jet AB create this beautiful topper. Base bead is in a different an unusual shape. Gold accents completes the stick! Price: $10.00 on straight sticks, see pricing guide when topper is put on Ketylo stick. Twirling Hematite beads and silver accents create this contemporary looking topper. Shown here as a pair, but only available now as a single. Price: $10.00 on straight sticks, see pricing guide when topper is put on Ketylo sticks. Red Czech glass sits beneath gold accented findings and a lovely Cloisonné bead in white with floral design. Gold accent resting on Czech bead is vintage. Czech bead is solid red. It appears to have color variation at right outer edge, but this is just lighting and not the bead itself. Price: $10.00 on straight sticks, see pricing guide when topper is put on Ketylo stick. Purple Czech glass and a milky green Celestial crystal creates a beautiful antique vision for this topper! Gold accents. Price: $10.00 on straight sticks, see pricing guide when topper is put on Ketylo stick. This is a great new "vintage" design! The gold "cage" beads are vintage. I am not sure of their exact age, but they are definitely vintage! I bought them at a historical home. Inside the "cage" is Czech glass beads in light blue. It reminds me of the shade of pool water! Also available in other colors! Just ask about yoru favorite! Beautiful gold rose accent completes the topper. Price: $10.00 on straight sticks, see pricing guide when topper is put on Ketylo stick. You're going to want to "just try" this new design! Mixing geometric shapes with beautiful pink Czech glass beads creates a whole new feel for hairsticks! Silver accents complete the topper. Like gold better? Also avaliable is gold, slightly different accents. Pictures available upon request. Price: $10.00 on straight sticks, see pricing guide when topper is put on Ketylo stick. Celestial Crystal (Similar in quality to Swarovski) in Cobolt sits atop beautiful color infused glass bead with swirling white design! Silver accents complete the topper along with curled headpin. Price: $10.00 on straight sticks, see pricing guide when topper is put on Ketylo stick. Celestial Crystal (Similar in quality to Swarovski) in Aqua sits atop matching faceted Czech glass bead! Silver accents complete the topper. Price: $10.00 on straight sticks, see pricing guide when topper is put on Ketylo stick. Last one!! Czech glass heart in baby blue sits below this pretty cobolt top bead! Gold accents. Special Price: $7.00 on straight sticks, see pricing guide when topper is put on Ketylo stick. Czech glass bicone bead in Sapphire blue sits between beautiful mixed color beads of blue and green! Antiqued brass accent. Price: $10.00 on straight sticks, see pricing guide when topper is put on Ketylo stick. On hold: Cat eye bead in pink sits atop beautifully embossed silver beads and accents! Price: $10.00. Can be made into a set on request. on straight sticks, see pricing guide when topper is put on Ketylo stick. The colors of Florida most lush fruits glimmer and gleam in this faceted set! Lemon and shades of Tangerine combine into one juicy stick! All beads are faceted Czech glass fire polished beads, including the spacer! Base on gold or silver, but shown here in silver. Price: $10.00 on straight sticks, see pricing guide when topper is put on Ketylo stick. I'm glad to reintroduce more from the "Dangle" line of sticks. 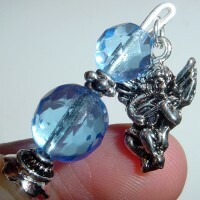 This lovely angel is perfect to dangle around the holidays! Beautiful blue Czech glass beads in faceted rounds complete the set with silver accents. Also available, hearts, crosses and elephants! All dangles are in silver. Price: $10.00 on straight sticks, see pricing guide when topper is put on Ketylo stick. Czech glass star bead rests at top and red crackle bead sits at bottom, while white Howlite bead is sandwiched between.This design was a combined effort of my niece and I. Silver findings complete this design. It's great for Christmas or even 4th of July, Memorial Day, and other patriotic holiday times! Price: $11.00 on straight sticks, see pricing guide when topper is put on Ketylo stick. For additional single sticks, please email me. Sometimes I can split a pair up, or make an identical one in a single. The singles shown above are one of a kind and cannot usually be made into a pair. 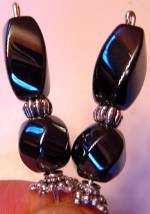 On occasion I have been able to later find matching beads, so if you are set on the style of a single, but want a pair, feel free to ask me about the possiblity for a pair! Don't miss our great singles on the Semi-Precious Gemstones page! New!! Now availble single "Ketylo" corkscrew, spiral sticks! Any single can be put on your choice of topper for $17 for shorts (5 inch stick), $18 for medium (6 inch sticks), and $19 for longs (7 inch sticks) unless the stick is priced $12.50 or more. The price then goes up an additional $2.00. All on gorgeous, exotic hardwoods! From left to right shown in all three sizes: Cocobolo, Lacewood (now discontinued), Gonalco Alves, Purpleheart, Moradillo, Bocote, Walnut, Cardinal, Kingwood, Canarywood, East Indies Rosewood, and Honduran Rosewood. Other woods now available for custom work. Also available without toppers. 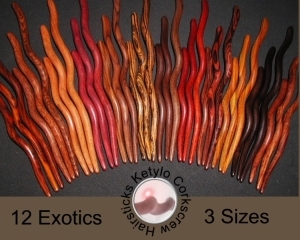 Dymondwood colors are also available, see the sticks home page for additional information!